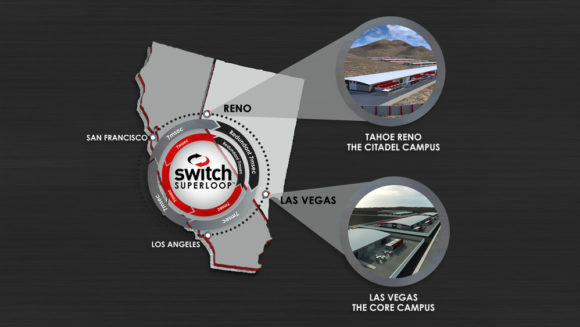 Switch CEO and Founder, Rob Roy, saw the opportunity to create geographically-redundant data center facilities in Nevada’s economically-beneficial business environment. Clients can now deploy mission-critical infrastructure and workloads in the world’s largest active-active data center ecosystem, connected by the SUPERLOOP®. The Tahoe Reno and Las Vegas facilities are 7ms apart and tied into our private fiber network with super scalability. The Switch SUPERLOOP® gives clients the advantages of a highly-available, fiber network in close vicinity to California’s technology industry, without high taxes, high cost of power, or the high risk of natural disasters. West Coast 1000 GIG Data Transfer Loop.